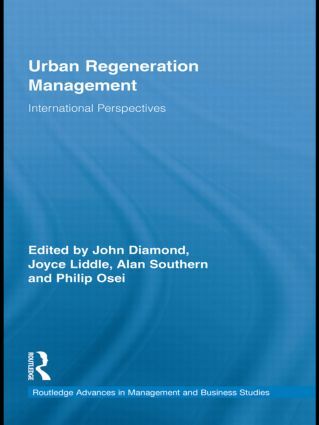 This book was born out of the need to ‘capture’ the experience and understanding of the regeneration management process that is neither UK centric nor centred exclusively on urban areas. Written by experts working in the USA, Holland, Greece, Jamaica, Turkey, Spain, Trinidad and the Czech Republic, this book seeks to locate the issue of regeneration in a context which will enable the reader to reflect upon practices which are ‘local’ but are shaped by international processes. As well as proving an accessible review of the theoretical literature on globalisation and its impact upon managing regeneration initiatives, this book also illustrates these theoretical debates with specific examples which provide insight to both urban and rural developments. This book will be of great interest to students, researchers and practitioners engaged in regeneration management, providing a thematic exploration and examination of the ‘global’ regeneration experience.